Brief Synopsis – A police detective must try and stop an evil plot to assassinate the Queen of England while she is visiting L.A.
My Take on it – In the 80’s the Zucker-Abrahams-Zucker team brought us some great slapstick parody movies. The genre got too diluted in the 90’s, but back when it way pretty much only them, they could do almost no wrong. The tackled air travel with the Airplane movies, WWII with Top Secret and after starting out as a failed TV series, they brought an amazing police parody to the screen. Leslie Nielsen was pretty much born to play this role (before he became the slapstick poster boy of the 90’s) and he is perfect with the jokes and the deadpan voiceover work here. Even after 27 years, I still laughed so incredibly hard at so many of the jokes here despite already knowing most of them by heart. Many of the scenes are so classicly funny that it doesn’t matter how many times one sees them, they will constantly laugh at the silly but very clever jokes whether they be via the witty dialogue or physical comedy. I must admit that a large amount of the jokes probably wouldn’t be used in movies today because they would be considered too un-PC, but that is part of what makes them funny because the point was to get the audience to laugh, not think about who they are laughing at. Besides Nielsen, this movie has an excellent cast of actors who usually don’t do comedy and they are all wonderful; George Kennedy, Ricardo Montalbon, Priscilla Pressley and even OJ Simpson are all great. I love this entire film, but being a baseball fan, the whole part in the Baseball Stadium is so hilariously funny. I also love how they credit many of the actors who have one line just by using their famous line. For instance, a nurse’s line ‘Oh, Dr. Alford, I have Mrs. Kepley’s chart if you’re ready to go over it.’ followed by her name instead of just saying nurse. Bottom Line – Hilarious movie that still gets me laughing hard 27 years on. Nielson is perfect in this role. Some great slapstick scenes never lose their novelty no matter how often one sees this. Lots of un-PC humor that would be less tolerated today but works amazingly in the plot. Great supporting cast of actors not known for their comedy. Highly Recommended! I remember showing my dad the bathroom-microphone scene and he & I being in tears. What an awesome flick! The “Naked Gun” never fails to make me laugh. I couldn’t agree more with you, Leslie Nielsen was born to play the role of Lt. Frank Drebin. No, I haven’t. I’ve seen the sequels to the first movie, and agree with you guys that they can’t hold a candle to the initial film in the series. They would end each episode with the characters doing a fake freeze frame. I should probably rewatch them too. There are only six if memory serves. Nice to see u around Jonathan, hope all is well! Thank you. I hope all is well with you too. If there are only six of them, I am going to try and find the on youtube, and watch them. I would like to see them. I hadn’t thought about the show, until you asked me. Great review/rewind. Airplane is probably my favorite Leslie Nielsen movie. 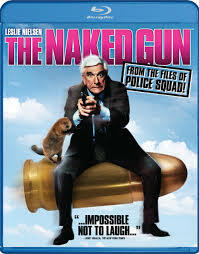 Even though I’ve watched so many movies like it, I haven’t actually watched “The Naked Gun” all the way through. I think it’s on Netflix so I will check it out this week. Love it, love it, love it. It’s hard to believe it is that old. It’s old or we’re old? 😉 such a great movie! Tnx for stopping by and commenting Keith! True. 44 here and I still get giddy over many of the same things. The amount of jokes in this!